Addiction contributes to poor communication, lack of trust, and even dysfunction in family enterprises. Data from a 20-year study led by ReGENERATION Partners indicates that over 50% of family firms seeking assistance from a family business consultant have an embedded addiction issue among the ranks of family management. While that percentage may startle, it’s no secret that abuse of drugs and alcohol is widespread. In the US – a 2009 National Institute of Alcohol Abuse and Alcoholism report warned that 3 in 10 adults drank enough to be at risk of alcoholism, liver disease, and other health and emotional problems. The 2010 National Survey found 23% of Americans, aged 12 and older, participated in binge drinking, and 23 million used illicit drugs. Go here for highest alcohol addiction rates internationally. Go here for WHO (World Health Organization) Resources for the Prevention and Treatment of Substance Use Disorders and other international data on addiction. Family businesses, however, may have greater risk. For example, succession is the dominant issue for long-term survival of family firms. If – or when – addiction impacts second, and later, generation family leaders, navigating the transition is often exponentially difficult. Aside from succession, the effects of addiction are widespread. Most common is poor/ineffective communication. Trusting communication is essential for a connected family but even more so when agreement is required for large business and wealth decisions. People with active addictions will take great risks to hide, protect, and deceive others from their use and abuse. This “double life” simply erodes trust and communication. Moreover, because we know that addiction is a family disease, each family member adapts his or her behavior to maintain a family balance. Consider this scenario in which the oldest son is drug addled. His mother, a co-dependent, has not slept more than three continuous hours in eight years. She is consumed with worry, guilt, and shame. She maintains a “my child is perfect” demeanor even after discovering her 38‐year‐old son passed out in her bedroom with a syringe nearby. I’m sure the readers of The Practitioner know of similar scenarios. Unfortunately, being a member of a family business may promote addiction and defend against seeking quality help. One reason is that family firm leaders’ power and influence may insulate family members from natural consequences and confrontation. Researchers have found that children of successful business families are at heightened risk for addiction. As reported by Boston based O’Connor Professional Group, 20% of affluent young adults present as needing substance abuse treatment. Affluence may travel alongside addiction because high-achieving parents lack time with offspring. Additionally, these heirs are often subjected to pressure from elevated parental aspirations. A privileged upbringing will often delay emotional maturity. Professional advisors and owners that seek to transition leadership to family members suffering from addiction impairment face a daunting task. Company culture and cohesion among leadership, including family, may suffer. Employees and family members that witness poor decision-making, favoritism, and absent communication will not view leadership favorably. It’s vital to address potential problems early in the family business developmental process. Providing next-generation leaders with clarity around what they must do prior to joining the family firm is critical. Providing a real job with accountability, presenting challenges rather than comforts, and giving parental guidance rather than indulgence are solid first steps to thwarting the addiction from entering the workplace. When addiction has already settled in, outside experts can assist with their external perspective, and apply tested solutions. The ReGENERATION study ranked addiction third among problems displayed by its clients, surpassed only by emotional disorders and family relationships. The typical family business struggling with addiction will rarely have in-house expertise. Addiction is a relatively new topic within the FFI community. 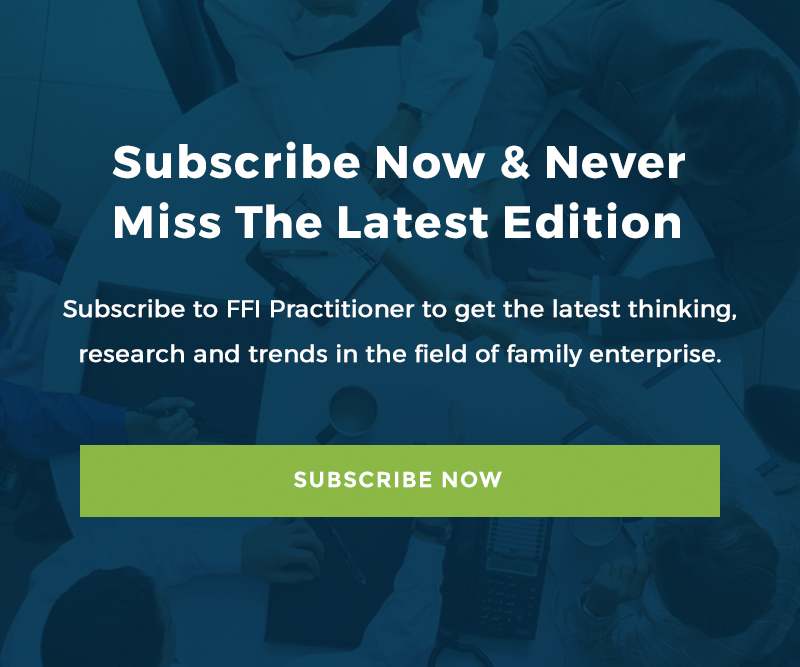 Leadership within FFI has recognized the fact that addiction is a major topic among the consulting community and has accordingly promoted more education on the topic. Several specialists in the FFI family are available to assist family business professionals with addiction intervention and treatment. But… there is much more to study, learn and put into practice for family enterprise professionals around the world.